Chicago's Englewood neighborhood is often portrayed as a dangerous and desperate community. Englewood does have it challenges, including high rates of crime and poverty. But many of its residents have not given up hope, and a new business development in the heart of the community is creating a lot of optimism that Englewood just might be on the cusp of a much-needed renaissance. Eddie Arruza: The strip mall is taking shape. Finishing touches are being put on the construction. And the excitement is building. Glen Fulton, Executive Director of the Greater Englewood Community Development Corporation: We're on the rise and it's the ripple effect. That Whole Foods Project is a ripple effect. 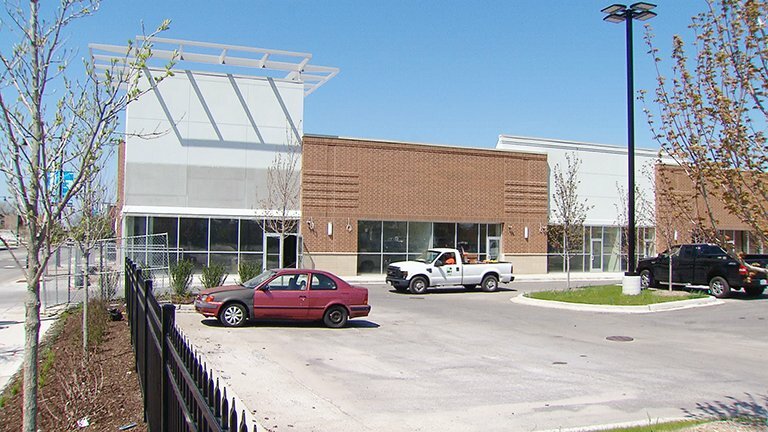 Arruza: Whole Foods is indeed coming to one of the poorest neighborhoods in Chicago. When the project was announced by Mayor Rahm Emanuel three years ago, it was met with some skepticism. The food store chain, after all, is known for its high-end items and prices that match. Even area residents were incredulous. Fulton: At first people were a little leery about this project, but when they started to figure out this was good for the community, I think it's changed the mindset. Arruza: It was Whole Foods itself, say Englewood residents, that did a lot to change perceptions of what it was bringing to the community. Rashanah Baldwin is a lifelong community resident who now is a consultant with Teamwork Englewood, a youth services and job force development nonprofit. Rashanah Baldwin, Teamwork Englewood: They reached out to the right individuals they reached out to the residents, the reached out to the stakeholders. They had informational meetings – they had several of them. They reached out to pretty much every organization possible in the Englewood community to make sure that the residents were engaged, that the residents knew the process, and understood that this Whole Foods will look different from the Whole Foods from downtown or even on the North Side. Arruza: Among the residents Whole Foods has reached out to is Nadra Smiley. She co-owns a hair-braiding business that her mother started 40 years ago. Along the way, Nadra developed a line of hair care products that will soon be on Whole Foods shelves. But the process of getting to that point was rigorous. Nadra Smiley, Amazon Natural Look Academy: So we had to know all the ingredients in our products, and to make sure that they were wholesome and natural and healthy for the customers that would be buying at Whole Foods. Arruza: Smiley is just one of a number of established and prospective entrepreneurs who have been working with Whole Foods, and the reviews for the store's interest in reflecting the community are very positive. Fulton: They've had numerous community meetings. They just had one for people who want to put their products on the shelves at Hamilton Park Last week. They’ve got another meeting coming up next month. So on a monthly basis, they have been really, really reaching out to the community, talking to groups and organizations and getting them involved and getting their input. Arruza: Two blocks from the forthcoming Whole Foods is the Dream Café, which opened a year and a half ago. Co-owner Howard Bailey says his unhealthy lifestyle and the lack of opportunities in the community led him to launch a restaurant that focuses on healthy and natural foods. Howard Bailey, co-owner of Dream Café: We got started here basically after living in the Englewood neighborhood for so long. I got tired of putting on weight and eating unhealthy, and me and my partner decided to do something about it. Arruza: But rather than seeing the new Whole Foods as a competitor, Baily is among those eager for it to open. Bailey: Englewood has definitely been underserved. We’ve had no access to fresh fruits and vegetables, which is amazing considering that one of the largest distributors of organic fruits and vegetables are three blocks away. Arruza: But not everyone who wants in on the Whole Foods bandwagon has made the cut yet. Among them is Leonard "GLC" Harris. He's a rapper who's worked with the likes of Kanye West. But he's also diabetic and lactose intolerant and he's developed some dessert products that meet his needs, including these mini cheesecakes that he wants to sell at Whole Foods. Leonard "GLC" Harris, entrepreneur: These are made from coconut, non-GMO soy and a few other added ingredients. All natural, everything comes from the Earth. And, man, when you taste it, you won’t even believe it’s not dairy. Arruza: Harris says he's still in talks with Whole Foods and needs to meet a few more requirements before the store considers adding his products to their shelves, but he remains optimistic for himself and the community. Harris: All I have to go by is my personal experience and the way that I’ve been treated. And the way I’ve been treated on a personal level has been sensational. Arruza: The new store is bringing something else that's novel to Englewood: In a long vacant space inside the historic Chicago City Bank building, a community training kitchen will be opened later this year. Fulton: If you look at the statistics, Englewood probably has the highest rate of heart disease, highest rate of diabetes. Any type of medical or health condition you can think of, we’re leading the 77 communities in that regard. Arruza: To say expectations for the new Whole Foods are running high is an understatement. But at least for now, Englewood has a reason to believe that better days are ahead. Among the commitments Whole Foods made when the store was announced three years ago was to carry a line of affordable products along with culturally appropriate items. Residents say they've been assured that the store is following up with that promise. May 5: Immigrant and refugee women find joy, companionship and healing in knitting. Jay Shefsky takes us to their workshop. April 27: Jay Shefsky visits an upscale consignment shop on the North Shore that has generated nearly half a million dollars for charity by selling designer clothes, accessories and furniture. April 5: Could a spice help rebuild Afghanistan? Could it decrease the production of poppy for opium? Meet three Chicago war veterans who have started a business with these goals in mind. March 30: Every discussion of crime, poverty or high incarceration rates points back – in part – to jobs. For the last three years an innovative restaurant job-training program in Evanston has been providing support and practical experience to young men and more recently, women. Jay Shefsky went to Curt's Cafe to learn more.